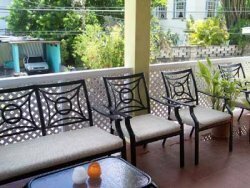 SUNDANCE is situated in Laynes Road, 50 yards away from the wonderful stretch of palm fringed golden sand of Paynes Bay on the prestigious West Coast. 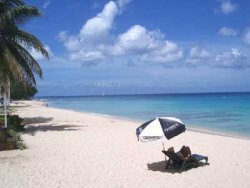 Parasols and sunbeds, drinks and snacks are readily available on the beach. It is an unusual area, there is a tiny church on the corner and further up the hill there are traditional Bajan chattel houses mixed in with stone built villas. Palm trees, bread fruit trees and hibiscus and all sorts of tropical plants abound. Beachside across the road the local fishermen sell their catches early evening , bars and restaurants are all within walking distance. 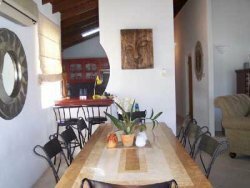 The accommodation is split into two apartments, Sundance and Sunbeams, both with four bedrooms. So this property is ideal for large families and friends to relax and unwind in such a breathtaking location. Sunbeams has also been made accessible for a wheelchair user. Six months has just been taken to refurbish the building to a very high standard with excellent facilities and lots of added personal touches such as the option of your very own house keeper, in order to make your experience that extra bit special. There is a delightful little garden at the back full of plants and perfumed flowers, plenty of chairs to sit outside for drinks and snacks or general collapse after a day slaving away under a palm tree, trying to decide whether to have a fruit punch or Pina Colada... decisions decisions! Sundance is accessed by a stairway to the first floor and entered from the front balcony. Two sets of double doors open into a large air conditioned lounge dining area, the wooden ceiling extends into the apex of the roof giving a very spacious and airy feel. There is a satellite TV, DVD and surround sound and music system so bring some cds with you. Sunbeams also has a large well equipped modern kitchen, three bright double bedrooms, (one with air conditioning and ensuite bathroom), and one twin bedroom. A family bathroom and laundry room with washer tumble dryer are also present. Sunbeams is the ground floor apartment and is entered from the front covered patio area. Two sets of double doors open into a spacious air conditioned lounge dining area with satellite TV, video and CD/Radio player. There is a bright and airy well fitted equipped kitchen, three double bedrooms, one being air-conditioned with an ensuite wet room (suitable for a wheelchair user), one single bedroom with vanity unit and one family bathroom. The back bedroom has access to a pretty balcony leading to the garden. 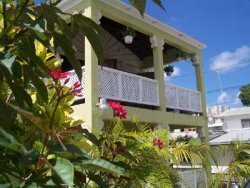 We purchased the building recently from a local family and it has been totally refurbished inside and out with an eye for style, comfort and luxury in spacious and relaxed Bajan surroundings. There is a small walled garden at the back with a wealth of shrubs and perfumed flowers. Local staff care for the house and its surroundings on a weekly basis.